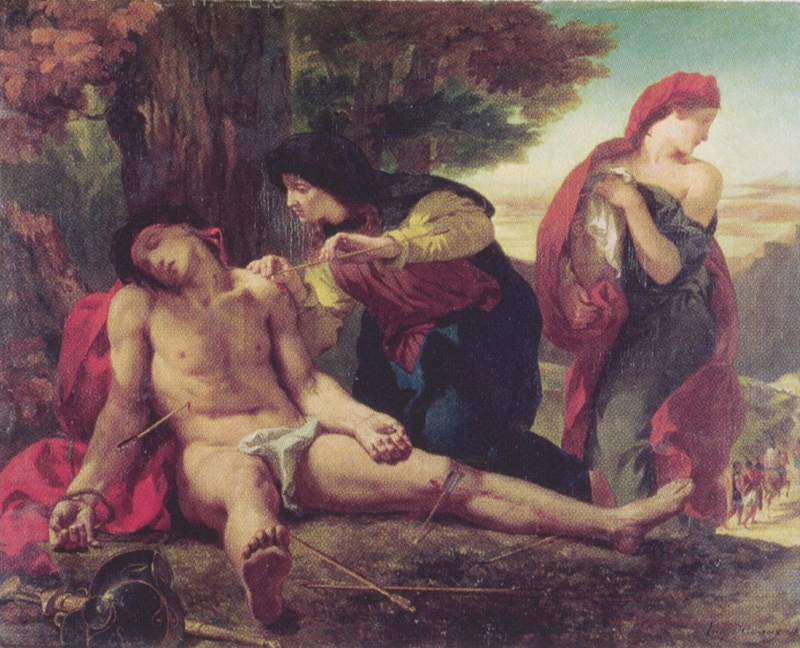 A later, less commonly depicted, chapter in St. Sebastian's story is the moment when St. Irene arrives with a female assistant to care for the wounded Sebastian. 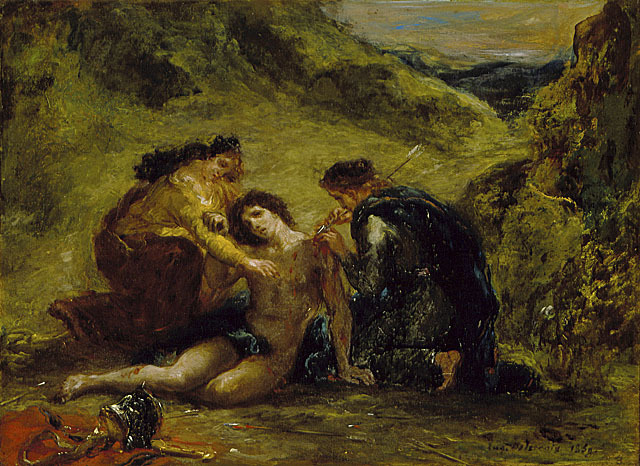 She is normally shown carefully extracting each arrow from his body, as here in this 1836 painting by Delacroix. 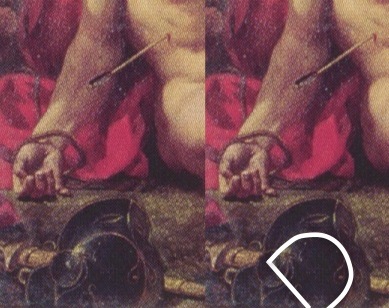 The ordinary viewer, though, is generally so certain that she is extracting the arrows that he or she fails to recognize that the artist has become "Irene" using his or her "paintbrush" (arrow) to apply "red paint" (blood) to the "canvas" (Sebastian's figure). 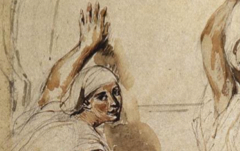 Although Irene holds the arrow here with two hands, another version by Delacroix shows her holding the arrow even more like an artist holding a paintbrush. 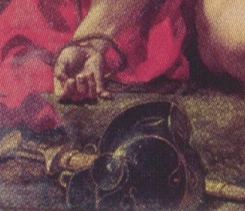 In the lower left corner of this composition Delacroix placed one of St. Sebastian's hands, a symbol of the artist's craft, next to a still-life of a sword and helmet. The sword is yet another iconic symbol for the artist's "brush" while the helmet's oval shapes here, with its inlaid curlicues, also suggests the shape of a "palette." In an oil sketch two years later Delacroix made St. Irene even more closely resemble a man leaning over his or her "artwork." 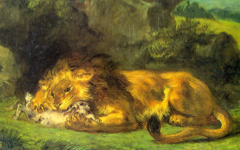 Remember that the poetic action in a painting may not be what you first imagine; it may even be the opposite of the apparent scene. 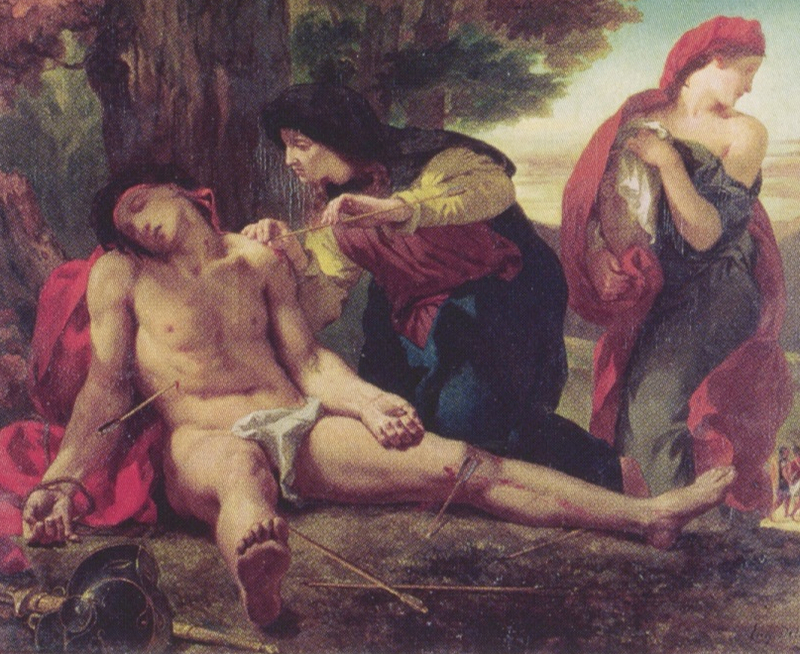 Here the saint uses her "arrow" to apply paint to St. Sebastian's arm, not take the arrow away. 1. See in particular Michelangelo's St. Sebastian in The Last Judgment, Dürer's Martyrdom of St. Sebastian, Hans Baldung Grien's St. Sebastian Altarpiece, Cranach's Venus and Cupid woodcut and Degas' Scene of War in the Middle Ages. 2. 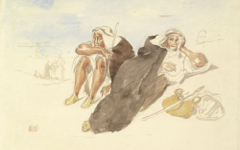 Delacroix made still-lifes in the foreground resemble his own initials in other works too, including Women of Algiers (1834) and Two Arabs Resting. Original Publication Date on EPPH: 04 Feb 2012. © Simon Abrahams. Articles on this site are the copyright of Simon Abrahams. To use copyrighted material in print or other media for purposes beyond 'fair use', you must obtain permission from the copyright owner. Websites may link to this page without permission (please do) but may not reproduce the material on their own site without crediting Simon Abrahams and EPPH.